What Reign hopes to do, above everything else, is surprise you…just enough. That ephemeral, perfectly-proportioned mix of the familiar and the surprising is the center of the show’s appeal. You want to have a sense of omniscient satisfaction as events unfold, but you need to be regularlysurprised—preferably by something so over-the-top that it makes you lunge for Twitter. The ideal state of a show like Reign is to make you feel equal parts flabbergasted and like God. Good luck meeting those requirements; soap operas are grueling work. 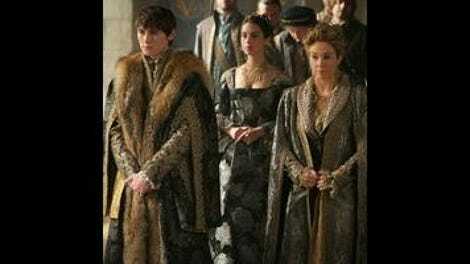 When it doesn’t work, an episode of Reign will baffle a newcomer and bore a lontime viewer. But when it works, this blend of vaguely feminist plot-a-minute historical commentary and good old fashioned pearl-clutching can be a delight. And after a long break, “Succession” is a solid Welcome Back, with both the predictable and the deliciously gonzo. The predictable aspects of any show are generally, less exciting. Ground must be laid, and TV audiences these days are pretty savvy; the most you can hope is that it all makes enough sense that we nod alone. We know how wrong the butcher-is-the-serial-killer assumption will be. We know Catherine’s speech for Narcisse will, one way or another, come back to bite her. We know Christophe hasn’t existed all this time simply to give Megan Follows an excuse to make that cat-that-ate-the-canary grin. But we do get a nice shot of the surprising amid all this setup, thanks to some return-to-form characterization for Lola, who somehow wandered away from her personality right after her marriage but has come roaring back; being a political hostage looks great on her. And Lola’s first act after Elizabeth threatens her? Get the biggest possible dirt on Elizabeth, and then use it to help her. It’s a kindness that gets buried in the fallout, but it offers a nice parallel to other small kindnesses this episode, and suggests there might actually be a future for this subplot. The dirt in question is one of the most gleefully soapy reveals this season has given us: William doesn’t love England so much as Queen Bess herself, and he arranged for her poisoning so she wouldn’t suffer the shame of an illegitimate child. It’s was a ruthless move, but it isn’t framed as villainy, either; the fact that he poisoned her to keep her from public humiliation isn’t the big reveal. (This show holds fairly strongly to the idea that ruthlessness among those the proximity of a monarch is dehumanizing but necessary.) The big reveal is that Elizabeth dismisses him from her service. In one blow, the English court veers at exhilarating speed from the track of history into the anything-goes gray area that Reign has made its own. Perhaps for the first time, I’m excited to see what Elizabeth does next. The idea of ruthless sacrifice for one’s country also haunts both Mary and Catherine, as per usual. Mary, despite being burned in effigy back in Scotland, has the better deal: She gets to decide how far she’ll capitulate to Protestant pressure, but from the safety of a court where—depending on how you read eye contact with the young king—she’s a welcome family member or a potential love interest. It’s one of Mary’s longest-running fears that she’ll lose herself to her people for the wrong reasons. She struggles with being willing to give up her humanity at all, but she’s clearly terrified to make a decision with such an uncertain outcome. Still, though Blackburn chastises her about not being true to herself and being too true to herself (#NotAllEnglishmen), at least she’s not being held hostage by a serial killer, so she still has a leg up on Catherine. Honestly, Narcisse would probably barely bat an eyelash; he’s known Catherine a long time and it’s maybe fortieth on the list of awful things she’s done. But we’ll assume from his affable toast at the coronation that he isn’t already plotting six ways to get that Regency back, and that this will ruin his budding fondness for her and light the fire of revenge under him for the eighth time this season. Let the show surprise us; that’s just what it wants to do. Half the serial killer mystery this episode is remembering it from back when it was the C-plot of the middle third of the season. And let’s be honest: Turnover at French court is high, but we know the body count these characters have racked up. Isn’t there always a serial killer in the palace? They just take turns. 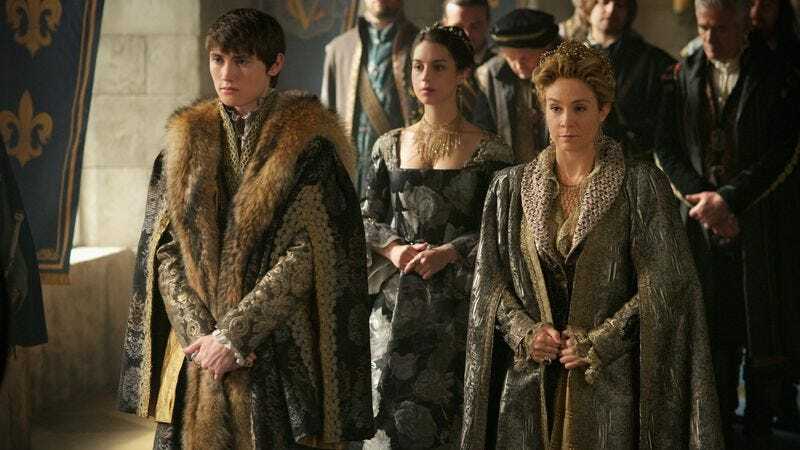 It’s surprising, in an episode that was so often dialed to Full Camp, that the coronation itself was at all affecting, but Megan Follows and Adelaide Kane getting a moment to act will do that for you. They each had a beat that brought Francis to mind, and watching the young King take the throne, the camera lingered on them long enough their parallel bittersweetness was clear. Elizabeth’s presence on the show so far has been largely As You Know Bob for the Tudor set, and she’s being portrayed as savvy and naive at intervals whenever the plot demands, which isn’t fair to a character who is obviously going to hold her own enough to keep her throne. Still, it was sublime, amid Elizabeth’s temporary delusions, to watch Tom Everett Scott perfect the longest-suffering blink in the entire world. Mysteries of ADR: “Friends don’t just stay at each other’s homes and buy each other pretty dresses. They do each other favors.” Did this cover up a line? Did it fill a long pause? Was the intent always to watch Lola barely able to feign interest in English court politics after three years of living in the French viper pit? We’ll never know. I like the hat-tip to Elizabeth that director Charles Binamé gave us as Lola and the world’s most instantly helpful maid peered in profile into William’s chambers. Was the master of coin supposed to be in Catherine’s rooms, or are we supposed to have forgotten those are Catherine’s rooms? Is this a stage play where we pretend it was a completely different space? I’m fine if it is; it makes more sense than Catherine letting anyone into her rooms. Lola, I know it was scary, but Elizabeth did you a favor torching those stunt dresses. It’s okay. Anna Popplewell’s expression as the maid assures her practically anyone would have been happy to murder Lady Dudley feels like the expression half of these people should be wearing all the time. Torrance Coombs’ expression after Catherine’s sentencing at the gallows is the one for the other half. Dress of the week: The High Gothic nightgown and formal robe Catherine wears when she tests her hypothesis that Christophe is a stone-cold killer is some perfect work; the coat is absolute royalty, the dress youthful enough to make us uncomfortable. I don’t like where the scene suggests this is going, but the costuming was spot-on. What other show on TV will give you such portentious fluting? Welcome back, Reign. Every sidelong glance a love affair, every cough a plague, every character beat a musical cue.